This weekend we'll tell you about what we did last weekend! 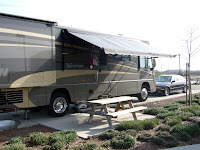 We were out of the office early on Thursday afternoon and headed out for a short drive toward Lodi and our destination - The Flag City RV Resort. For most people, Flag City is the kind of place that's perfect for an overnight stop along I-5. 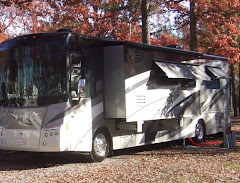 For us, it was the place to meet up with our Winnebago friends, The Chardonnay Travelers. About 20 rigs showed up for this rally - There were Winnies everywhere! There's Bullwinkle in the front row. Here's a closer look at our site at Flag City. Is that Rocky, our trusty toad, sharing the site with Bullwinkle? No! Rocky spent the weekend, and most of this week, in the shop. So, M followed P to Flag City in the beemer. It wasn't as much fun, but it was a lot more comfortable! We're so spoiled now, we just can't leave home without another set of wheels. We enjoyed great company and good food all weekend. It was nice to catch up with the travelers we hadn't seen since Santa Nella or Oroville, and meet members we had yet to meet. The weather cooperated for most of the weekend. Saturday night the winds kicked up and the rains poured once again. Sunday we packed up in the wind and rain and carefully caravaned home. With back-to-back soggy weekends, we're looking forward to an outing with warm temps, clear skies and calm winds! Mother Nature made a big deposit toward bringing an end to Northern California's drought this weekend. And, while she was at it, we went camping. 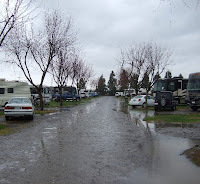 Knowing the weather wouldn't be the best, we looked forward to hooking up with our FMCA friends at this Thousand Trails park about 25 miles north of Sacramento. This is a photo of one of the roads in "D" section disguised as a river. 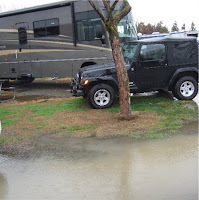 We were camped on the shores of Lake Minden, but not this close! This lake-sized puddle formed around our campsite over the weekend. We were glad we had our four-wheel-drive Jeep to get us through! Precipitation totals for the weekend were somewhere north of three inches. Winds were sustained both nights between 25 and 30 MPH with gusts pushing 50. We were rockin' and rollin'! 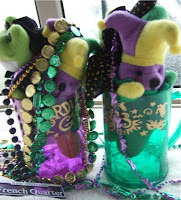 The theme of this weekend's rally was "Mardi Gras". It featured lots of food and fun, including these little colorful party favors. Everyone donned masks and beads, but we didn't get any pictures. Despite the weather, a good time was had by all. With all that rain and wind, we spent quite a bit of time inside. Our boy kitty kept us entertained with several (repeat, SEVERAL) rounds of fetch. Here he is chasing his pink foam ball to the other end of Bullwinkle. And, here he is returning it. (Yes, we think he thinks he's a dog!) It was all very entertaining. He was good for a dozen round trips or so, then he'd have to rest. 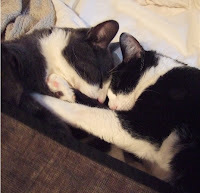 Speaking of rest, the cats managed to get a lot of it this weekend. (Aren't they cute?) 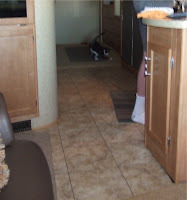 They're really getting the hang of this RVing gig. They seemed quite comfortable. And, that's a really good thing! 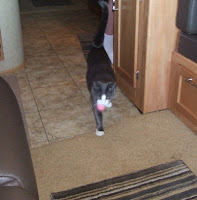 On the way home we made a short stop at the Cal Expo RV Park in Sacramento for a special visit. 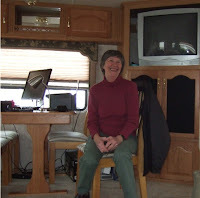 We've been following the travels of Martha, a fulltime RVer who bought a fifth wheel trailer last year back east (That's what we call it here in California) and made her way across the country. It was great to meet her in person, and we look forward to seeing her on the road sometime. She'll be working at Mt. Lassen National Park this summer. We'll have to find our way there! Have I told you how much I love my new Crocs? I've been meaning to post this picture for awhile because it'll make some little girls we know laugh. But, it's especially timely after this weekend. 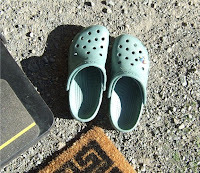 These Crocs are the perfect RVing shoe! (Who knew?) I keep them close to the door and they make getting in and out of Bullwinkle a breeze, in all kinds of weather. I recommend them!